"Classic Blue" from D.L. Bliss, Lake Tahoe, California. 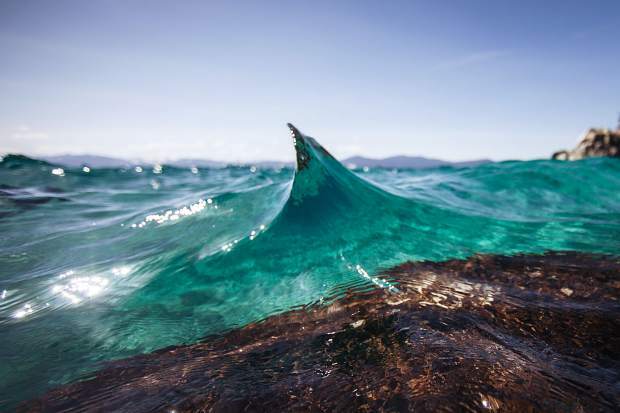 "Every Drop" from Secret Cove, Lake Tahoe, Nevada. 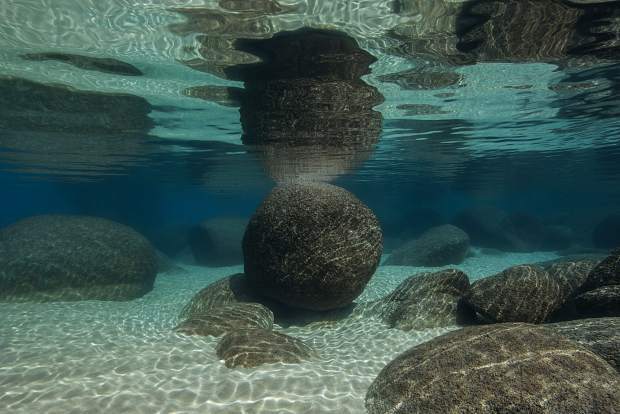 "Round Rock Reflection" from Divers' Cove, Lake Tahoe, Nevada. "Clean Granite" from West Shore, Lake Tahoe, California. "Cobra" from Chimney Beach, Lake Tahoe, Nevada. "West Shore Snow" from West Shore, Lake Tahoe, California. 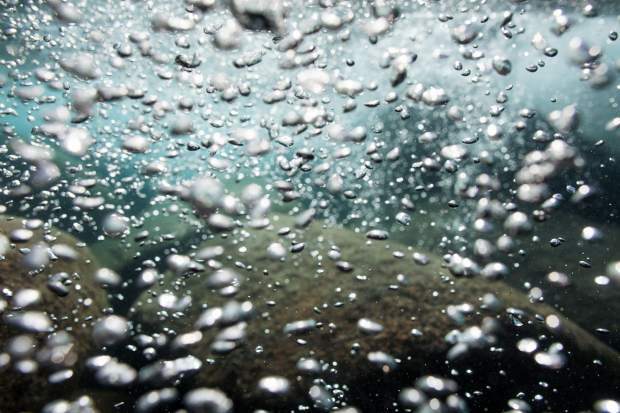 "Bubbles" from Chimney Beach, Lake Tahoe, Nevada. "The Dome" from Secret Cove, Lake Tahoe, Nevada. "South Shore Curves" from Regan Beach, Lake Tahoe, California. "Blue Granite" from Sand Harbor, Lake Tahoe, Nevada. "Sand and Rock 1" from Cave Rock, Lake Tahoe, Nevada. 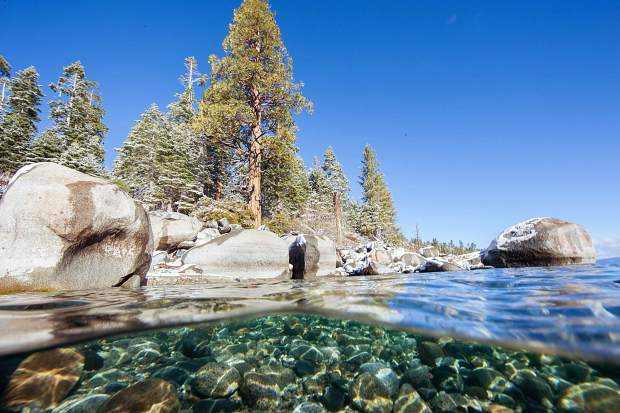 Silver’s large collection of “Tahoe Clarity” prints are available for purchase on www.tahoeclarity.com, where you can also browse his gallery and read about his latest dives on the blog. Tahoe Clarity is on Instagram (@tahoeclarity) and Facebook (www.facebook.com/tahoeclarity). 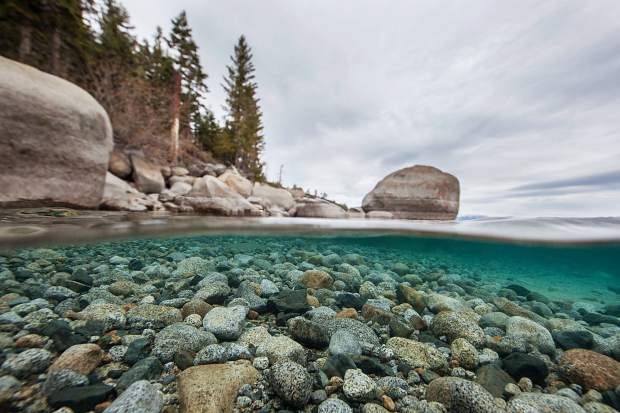 Several “Tahoe Clarity” prints are also on display at the Benko Art Gallery, located at 3929 Lake Tahoe Blvd. 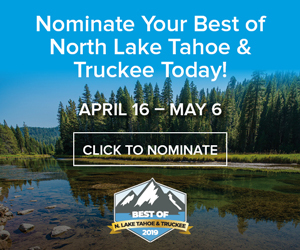 #2 in South Lake Tahoe. 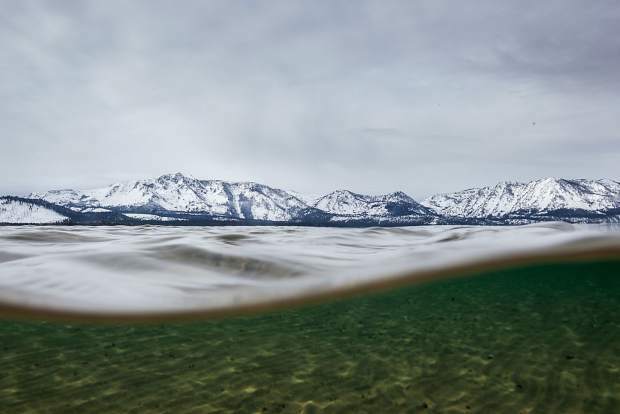 Journalist and photographer Dylan Silver slips into a 9 mm-thick wetsuit, booties and gloves before diving into Lake Tahoe on a winter day, underwater camera in hand. 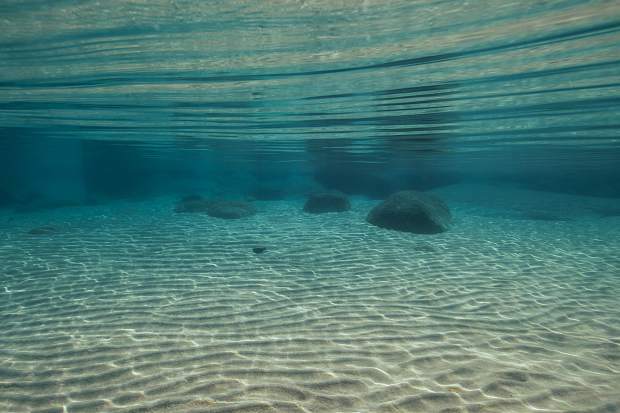 Below the surface, it’s quiet — no boats churning up the water, decreasing the lake’s famous clarity, or other swimmers disturbing his solitude. The water temperature is around 40 degrees, after all, and there’s snow in the mountains. 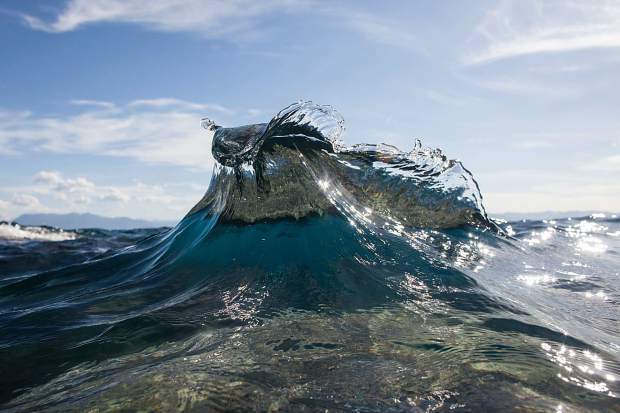 “Taking pictures of water is unlike other photography because it’s very serendipitous. 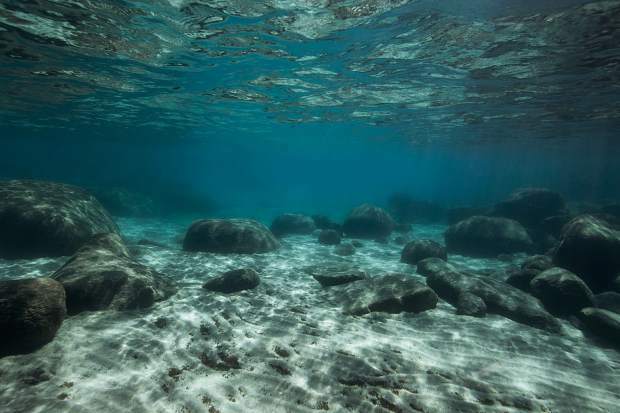 The water moves so quickly and in ways that you can’t capture just by looking at it,” explained Silver. All around the lake, Silver has favorite spots to shoot for different reasons — Secret Cove on the East Shore for its shallow teal waters and D.L. Bliss State Park for its exceptional clarity, for example. 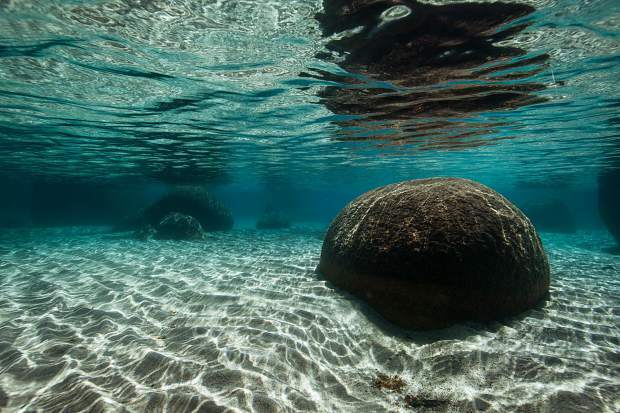 Underwater, Silver encounters unique rock formations, sand patterns, fish — like mackinaw and Tahoe suckers — and hundreds of pairs of sunglasses. A lack of people dropping said sunglasses in the water is part of the reason that Silver prefers swimming and shooting during the colder months. “I feel so lucky in the winter because it feels like I have the lake to myself. In the summer it’s trickier. If you’re diving, you have to be concerned about boats, and you can actually hear boats underwater, so it’s a little bit distracting,” explained Silver. 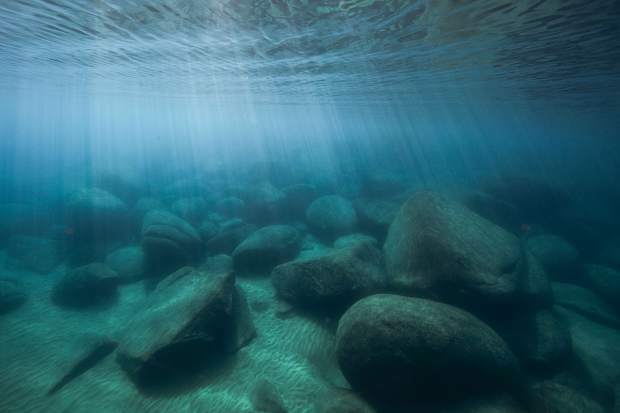 As his project title suggests, clarity is a big part of what makes Lake Tahoe unique — and preserving that clarity is a big motivator for the underwater photographer. 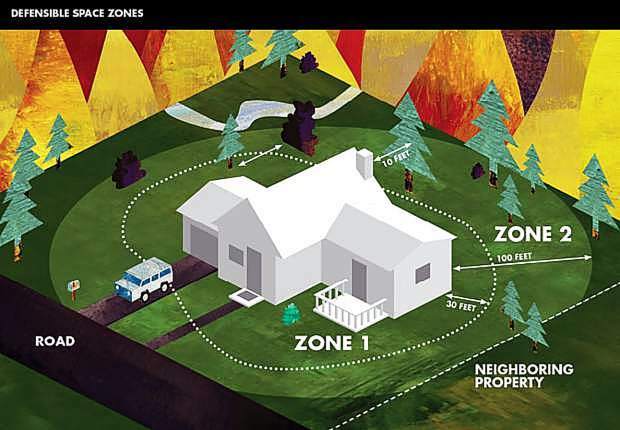 Silver has begun selling his prints online, and is donating a portion of those proceeds — as well as complete access to his photos for marketing purposes — to The League to Save Lake Tahoe.